This week just won’t slow down but I’m still on the go. On Wednesday, I went to rehearsal for an upcoming geisha show, then that night was the BFA Mardi Gras. Then yesterday afternoon was the April geisha show at the Kabuki theater in Hosoi’s Kansai region. And that night was also Ellie’s Springtime bunny rabbit party. In between Taka and I have been getting serious about the new home he is building for me. Then on Wednesday, here’s the geisha show rehearsal at the kabuki theater. That night was Blues for Autism’s Mardi Gras which I wrote about in BFA blog. Taka hadn’t arrived yet but there I am in the center if you squint your eyes. In the process of shooting pics for the BFA blog, I neglected to get a photo of me or Taka. Fortunately, Thor got this great pic of LeLe & him all decked out. Then came Thursday. 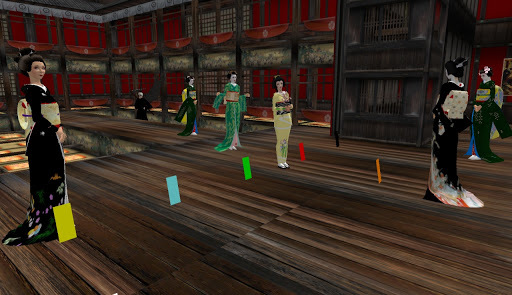 The geisha show was scheduled for late afternoon (3pm SLT) and I was all dressed up in my kimono and senior maiko makeup and ornaments and fancy hairstyle. All was fine, I was scheduled to dance in the 3rd act and was happy as a clam. In fact, I was honored just to be invited to perform. And by the way, honored to be made a member (altho with no official standing) of the Nananoshima Okiya. Technically, the fact that I’m married and to a samurai no less, disqualifies me from being a geisha or even apprentice geisha, so these opportunities to perform with such a great okiya is truly an honor. The reason I’ve been given this opportunity is that when I was an apprentice geisha at the Little Yoshiwara Okiya back in 2008, my onesan (big sister) was Masumi san (Masumi manamiko). And we have stayed friends over the years and when she saw me perform at the Winter party back in January, she apparently decided that I still have the skills to perform and this is the second time now she’s asked me to be in one of her shows. Anyway, along with being a most excellent geisha show producer and director, Masumi san is also full of surprises sometimes. So, just minutes before the show was to begin, Masumi handed me the script for the 1st act and asked if I could perform. Hehe. Well, after I got my heart back out of my throat, I agreed (the girl who was going to perform was unable to be there). Ok, I don’t have any photos of me performing because I was … performing. But here is a photo of us backstage, just before the curtain opened. 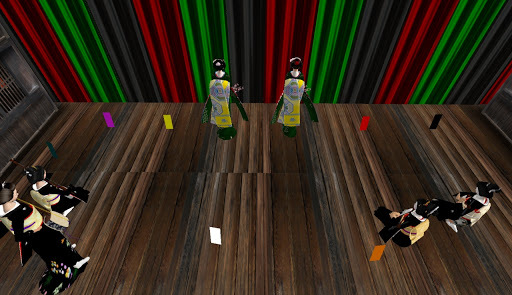 Maiko in front in green with yellow obi, geisha in back in black playing instruments. Btw, all donations to the geisha show went to the Japan Relief Fund. More on the geisha show when I publish a story in the Hosoi Ichiba blog. Look for it really soon… like this weekend. After the geisha show, there was a few minutes to change then race over to Ellia Noel’s Springtime bunny rabbit party. hehe. Ellie always throws great parties and she had Tone Uniza performing live while Taka and I were there. I’ve caught Tone’s shows on several occasions and he’s top notch. Here’s another photo form the party, from left to right is Claudia, Gracee (pink bunny), Ellie (pink bunny of a different kind) and Jacan Slade. I don’t know how people remember all the things they do here in Second Life. I mean, the only real sense we have is that of sight, so there’s none of that other stuff like smell, taste, touche and all those more subtle senses that never form the right kind of memory connections. Yanno? Anyway, when I have days as active as the past few, I really need to write about it. So many of these memories are just too precious to me. Tonight (assuming today is Friday) is the Beattles Concert for Blues for Autism over at Underground Garage. 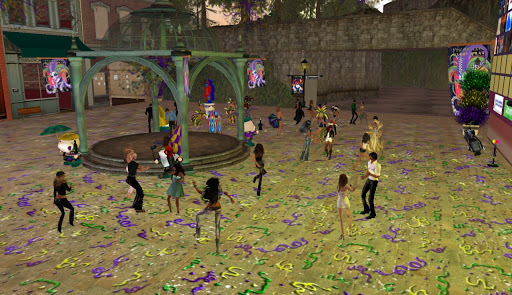 It starts at 6:00pm SLT… Y’all come. This entry was posted in Journal and tagged Nightlife, Parties, Second Life, Socialite. Bookmark the permalink.